Jesus The Radical Pastor: WERE OUR FOUNDING FATHERS GOOD, EVANGELICAL CHRISTIANS? WERE OUR FOUNDING FATHERS GOOD, EVANGELICAL CHRISTIANS? I didn't know about this book. 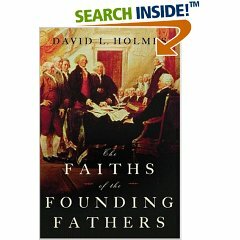 The Faiths of Our Founding Fathers (picture on the right is from Amazon.com). You can read Ben Witherington's review here. Be sure to read the "comments," too. You will get involved in quite a virtual conversation. Sounds like the book lays a fairly accurate history. I addressed some of this in a older post on nationalism some time ago. It should be said, of course, that even if the faith of the Founding Fathers of the US is at question, the influence of being a force for Christendom is not. Christendom was the defining worldview in the West, even for those who rejected Christianity. Sometimes was embraced unknowingly, other times it was recognized as inevitable, and thus needed to be creatively "used" for their purposes. The means by which the American Revolution recruited and maintained such a powerful force of soldiers is a prime example. Thanks for point out the review. Could you "cut and paste" and send me your essay on nationalism? Yes, quite a conversation over there. Thanks, John. I wasn't aware of such a debate. Were you? Not to the extent it is put there. So much. Very good conversation. Really makes me even less favorable to the high profile religious right people, who push this claim, and so hard. I do wish we'd all just look for the way it really was. And accept that. But, I guess this is all part of their particular culture war, and they're grabbing on to what they can, and what they can find, to fight it.